The quick-rising success of online newspapers has changed the way we get our news. Nowadays, you can sip your coffee while searching and reading the top local news in a matter of seconds. With the steady growth in popularity of online news, news blogs and websites have become profitable businesses. While content is obviously the lifeblood of news websites, the a news site’s design is just as important so that readers can easily navigate and read the news. You can find many news WordPress themes great for starting and creating a website in minutes. Finding the perfect theme should be your first step, before even considering working on your content. Portus aims to be the best news/magazine theme you will ever use. It also tries to simplify the customization process as much as possible so that you can quickly get up and running with the theme. With only one click you get all the necessary plugins installed as well as the dummy content imported. It’s a fully responsive theme and it comes with a jQuery plugin that resizes all the images to fit all screen resolutions perfectly. Packing an impressive 11 different page layouts, a drag & drop page builder, 600+ fonts, and lightbox galleries, the possibilities are endless with this theme. This theme also comes with an impressive video and text documentation to help you along the way. Give Portus a try today! Backed with the best SEO practices and incredible page speed, as well a clean and modern design, NewsPlus is a great choice for all sorts of magazines, news, blogs and many more. This premium newspaper WordPress theme comes with various advertisement spots in some of the best page locations to help you earn revenue easily. NewsPlus is retina ready and responsive, looking perfect on small devices and large ones alike. 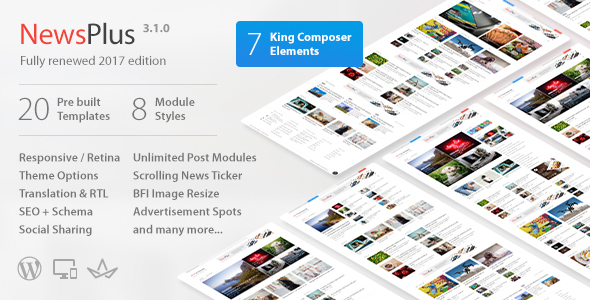 It comes bundled with King Composer, one of the fastest and intuitive page builders to help you create the page layout you want for your content. It also comes with a great addon to generate multi styled posts. NewsPlus has a lot of other impressive features, which I recommend checking out. 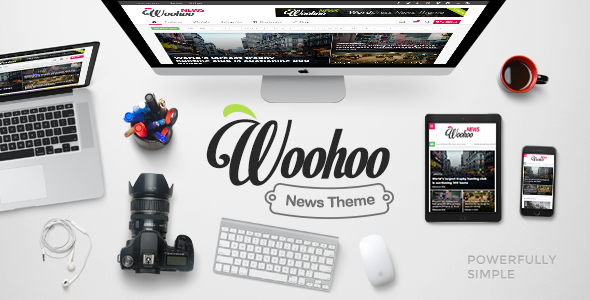 WooHoo is a stylish and sleek WordPress theme that will enhance your website with some trendy features. With various demos to choose from, you can use it for tech, health, fashion, sports and news blogs. WooHoo developers understood how important it is to deliver the content fast to users and high-speed is guaranteed. With a one-click demo installation and easy set-up, there is no need to know coding in order to use this theme and customize it. It is the perfect theme for WordPress beginners. 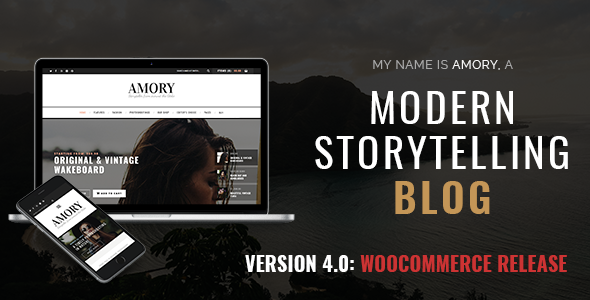 WooHoo is compatible with WPML, as well as WooCommerce, for shop owners. 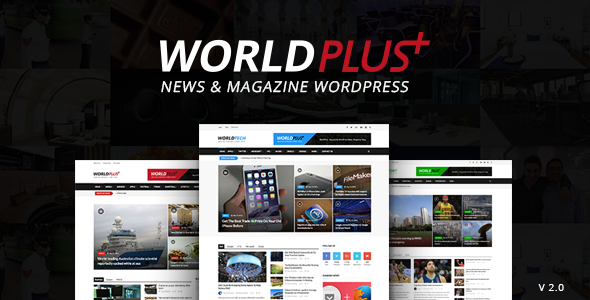 If you want to create a modern, clean and professional news website, then look no further than WorldPlus. This stunning premium WordPress theme is fast-loading, highly customizable, and incredibly easy to use. All its users will benefit from powerful features essential for news websites. Use the drag & drop page builder to create beautiful and unique page layouts, and then improve them with the 7 different custom sidebars. When your content changes, your layout should, too! Some of its many features are: unlimited demos, review system, mega menu, social counter widget, smart content blocks, and many more. Check it out today! 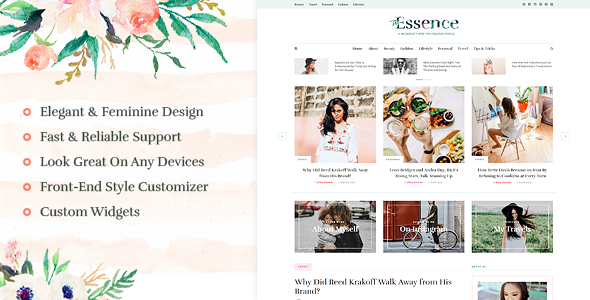 With an elegant and feminine design, the Essence works amazingly well with any type of blog, news, or magazine site. Apart from the beautiful design, it also comes packed with useful features: multiple layouts, custom social widgets, featured slider and many more. It's also translation ready if you need to create a multilingual site. Choose the perfect layout for you from the amazing 17 different homepage layout options, and then customize it easily using the front-end customizer: MeridianStyler. Give your posts the social exposure they need using the Essence’s impressive social media elements. Their customer support team is really great and always happy to help, so any time you have questions you will certainly get a fast response and simple solution. Wonderwall is a gorgeous, responsive, premiums WordPress magazine theme. This is not a generic looking theme and it give its users plenty of options to make it unique and flawless. Wonderwall comes with more than 5 different featured posts sliders to showcase your latest news and over 11 content modules. Mixing these together will allow you to create a beautiful and original homepage. Using the integrated YellowPencil you will be able to modify your typography, colors, styles, fonts, spacing, etc. To give you a head-start, Wonderwall offers 9 interesting homepages you can use out of the box. Try Wonderwall! ViralFeed is a new premium magazine WordPress theme with a stunning, modern, and cool design. It is highly customizable and has a bunch of amazing features such as several blog layouts, a parallax effect, reactions for single posts, weekly and monthly popular posts, and so much more. Made by a ThemeForest elite author, ViralFeed is very easy to use and you can set it up in literally minutes thanks to the one-click demo install. One click and your site looks exactly like the demo. Also their support team will do their best to help you to solve all problems as quickly as possible. Adding ads to your website has never been easier, as well, as this theme comes integrated with the WP Quads AdSense plugin. Highly recommend this theme. With over 3,000 sales, FlexMag has slowly become one of the most popular newspaper WordPress themes, and with good reason. A very simple and flexible theme that can be used for multiple purposes such as portfolio, magazine or corporate blog websites. Fully responsive and with 9 featured post layouts to choose from, you can display your content the way you want, without having to worry about looking good on mobile devices. Select from 4 pre-set skins and 8 article layouts to configure your theme and make it unique. If you want to feel the premium experience FlexMag offers, try it today. 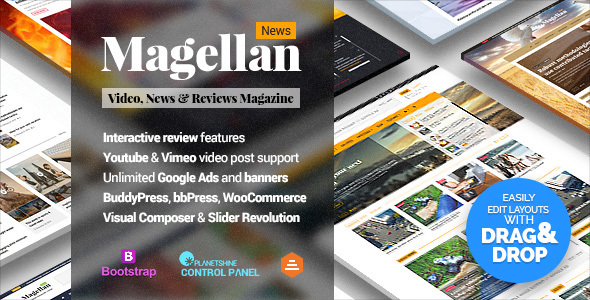 Magellan is the news WordPress theme to beat! With an amazing and elegant newspaper style, Magellan can be used for any niche of news from tech and sports to gaming, lifestyle and fitness – each with its own demo content and layout ready to go. This interactive and powerful news theme comes bundled with some pretty cool and popular plugins like Mega Menu, Slider Revolution and Visual Composer. Video posts are becoming highly popular, and they are available with Magellan, so you can showcase your posts in different ways. The theme’s control panel is intuitive and easy to use for beginners – you don’t have to know a lot about WordPress to use this theme. 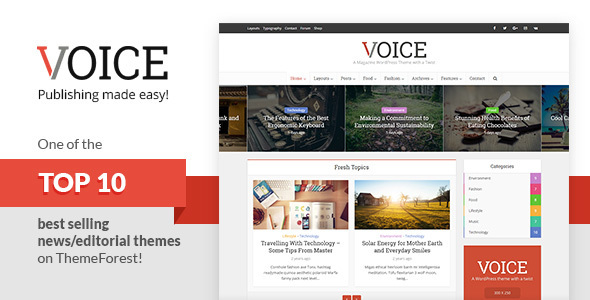 Voice is one of the TOP 10 best-selling news and editorial themes on ThemeForest because it is a theme focused on being efficient and fast. Highly customizable, packed with features, and with built-in performance options, Voice is a great choice for news websites. This theme comes with full documentation to help beginners set it up easily, unlimited fonts and colors, advanced theme options, responsive design, and over 150 post listing combinations to truly make the website your own. 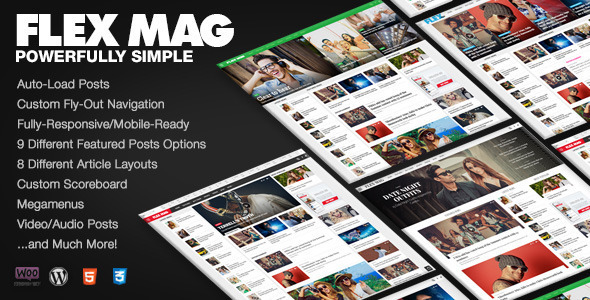 Optimized for magazines, news and blog websites, SmartMag is a modern yet clean, responsive WordPress theme. With a drag & drop builder, creating a unique and beautiful news website has never been easier. It has various unique demos to choose from, multipage content slideshow, is responsive and compatible to all mobile devices, and rtl and translation ready. Customizing the theme is easy and intuitive, but if you are still having trouble, their support team is super-fast and helpful according to their reviews. Exclusively designed and built for news websites, BoldNews is packed with stunning and useful features. 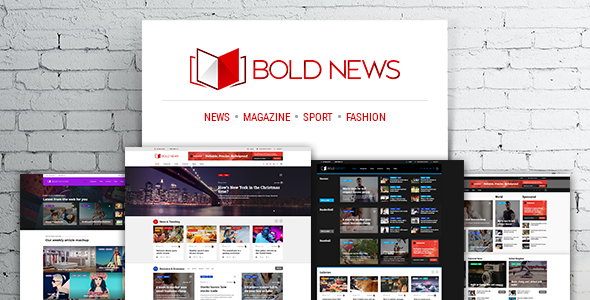 BoldNews contains 4 awesome sample homepage layouts, and it was carefully designed to fit to all screens whether it’s a phone, tablet or desktop. Fully customize your layout and make your content stand out using the integrated Bold Builder, and choose from several header and menu styles, unlimited colors, article layouts and typography. No matter what your expectations are, BoldNews will deliver! Soledad is a theme with a unique design and plenty of customization options. It has an impressive 2,000 demo homepages you can choose from, and that’s not all. With over 800 sliders and blog magazine combinations and 400 customization options, we have to give it to them – this is a truly flexible theme. Amory is the definition of a clean yet stunning theme. With this theme, users are able to tell their stories not only through text, but design also. Amory allows you to play with the layout, sidebars, colors and typography in order to create the perfect canvas for your content. It comes with one of the most popular slider plugins, Revolution Slider, as well as Visual Composer. Some of Amory's most amazing features are: dedicated ad spaces, Instagram feed, photography blog layout, and SEO integrated technologies. This WordPress blog theme is fully documented and it offers incredible customer support for those who need it. Give it a go; I’m sure you’re going to love it! An awesome premium WordPress theme that will help you design the news website you want using its amazing and cool features. Without having to know coding before-hand, you can create a fully responsive, beautiful, and intuitive news magazine. 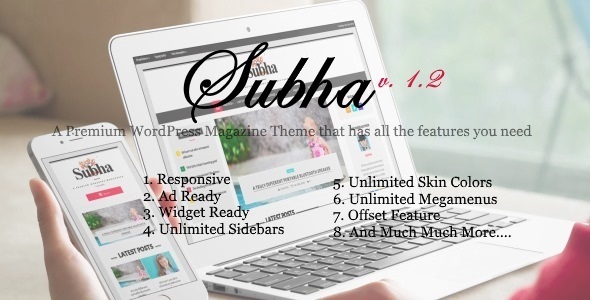 Subha comes with fantastic features as unlimited blocks for the homepage, 6 different types of mega menus, unlimited theme skins and custom sidebars – all these features will certainly help you create a unique website in a short amount of time. Captivate your audience with this incredible theme and try it today! Newsmag’s modern design is perfect for everything from online magazines, to news portals and even personal blogs. It has a flexible, easily customizable layout to make the site your own. It is SEO optimized, stylish, comes with easy-to-install demo content, is user friendly and packed with striking visuals. With this theme, your news posts aren’t limited to text. Create beautiful video, audio, gallery, or quotation posts with Newsmag’s enhanced post format support. Gillion is a simple, yet beautiful theme especially designed for this niche. You cannot go wrong with this theme because of all its great features and stunning design. The demo content is available through a one-click demo installation and all the images are free to use. It comes with four header designs and thirteen custom widgets so you can create a beautiful news website without having any coding knowledge. Not to mention that you also get Visual Composer along with the theme - this is a great and helpful tool to have. 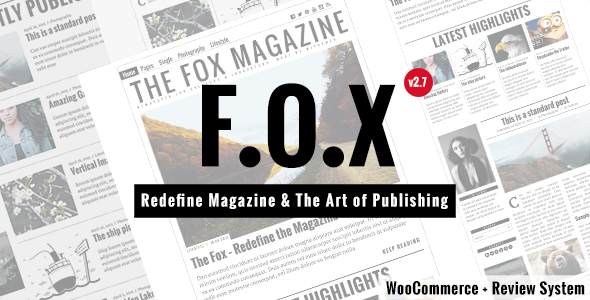 The Fox is one of the best multi-layout blog and news magazine themes, and it comes with various layouts to make it your own. Use the Live customizer to create art and redefine the world of news magazines everywhere with The Fox. The Fox is a fully responsive WordPress news theme, so your website is set to look amazing on all devices. You can choose a different layout for each category so you can make your layout unique and intuitive. Create a 2 columns layout for your posts, in order to imitate the feel of a real newspaper. Optimized for SEO to maximize your traffic and get your website in the top! Onfleek has a contemporary and interactive design to help you showcase your content beautifully. It uses the new Google AMP technology to load faster on mobile and and improve the overall mobile user experience. Choose from the available 9 post formats to tell your stories in different and unique ways. Display important elements for certain articles only by using the 8 custom widgets. It also offers a bunch of ads spaces to earn some money for your work. Onfleek is great for beginners as well as advanced WordPress users. 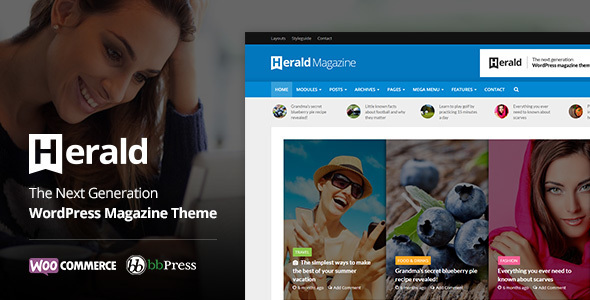 With an impressive 4.91-star rating on ThemeForest, Herald dominates in functionality and design. It’s one of the best newspaper WordPress themes to deliver lots of content because the cool design makes it feel spacious and easy to navigate. Herald offers a bunch of customization options, like few other themes do. From an impressive 500+ layout options to unlimited sidebars and custom widgets, you truly cannot go wrong with Herald. Speed is a must with a news theme, and this theme delivers. If the 500 layout options are not enough for you, then know that the header is 100% modular for more creative freedom. Herald is the theme you were looking for. Brought to you by an elite author, MagOne is clearly aiming to improve magazine and news website everywhere. 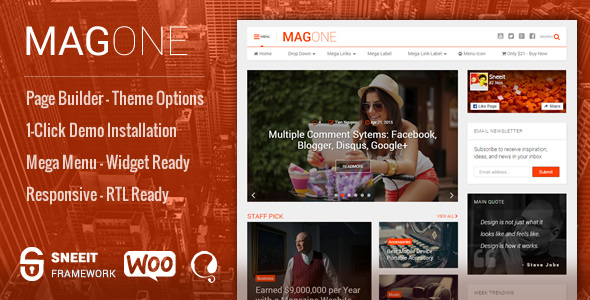 MagOne provides multiple layouts, which makes it incredibly flexible and easy to make your website unique. All the demo options are included and very easy to set up with the 1-click install via the admin tool. If you want to take matters into your own hands, you can do that by using the Drag & Drop page builder and the Sneeit Framework to create something all your own. You can make changes to the layouts, pages, posts and more with just a few clicks. Multinews is a multi-purpose premium WordPress news theme for newspapers/magazines with a great design and useful features. This theme is packed with awesome and unique features and will certainly help you create a great way to boost your content. Make your news/magazine feel more like the real deal with the ‘Flipping magazine’ features. Invite users to share your posts with Multinews’ aesthetic and effective social share widget. Create beautiful menus, use different layout for certain posts, and add and manage advertisements easily on your website. 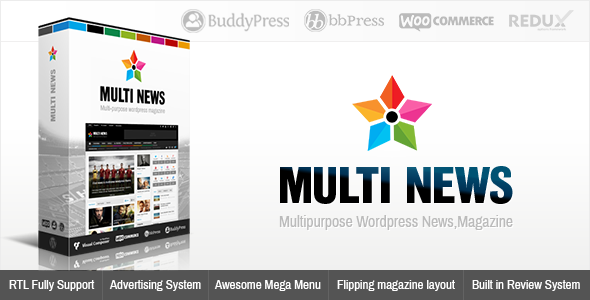 If you want a theme with a bunch of helpful features, then Multinews is the theme for you! AlYoum is an incredible blog and news magazine WordPress theme that will enhance the overall look of your website. Extremely flexible and highly customizable, with AlYoum creating a unique and beautiful news website from stratch has never been easier. The option to import the demo content with just one click will give you a head start and then it’s up to you to enhance it using the drag & drop page builder. With 17 amazing layouts, unlimited menu locations and menu options, there is no wrong choice. Apart from that, it also comes with several header and footer designs as well as various shortcodes and widgets so you can maximize your experience. The latest version is 6.0, and they upgrade, improve and add new features continuously. Legatus is the definition of a clean, elegant and responsive premium WordPress news theme. It can be used for blogs, news, magazine, review or publishing sites. It’s beyond simple to use and set up and has been SEO optimized. The unique design is definitely a plus, but if you want to make pages more complex you can use the built-in Visual Composer. It comes with an incredible weather report, which is a very useful tool for readers. Create awesome custom photo galleries with Legatus as well as custom menus with the custom mega-menu feature. Whether you change the layout of the theme from boxed to wide, add a breaking news slider, use the unlimited Google fonts or colors, one thing is certain – Legatus is a great buy. 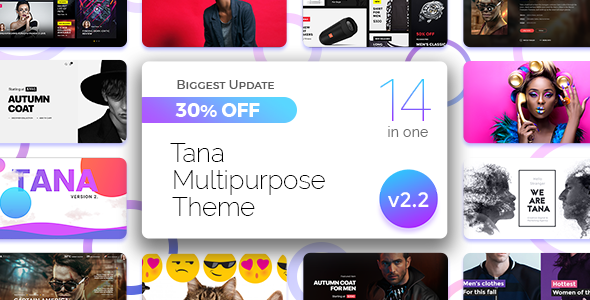 Tana is a clean, gorgeous, and modern WordPress theme perfect for creating and crafting unique news/magazine websites. With Tana, developing an elegant and interactive news website is a piece of cake. Browse through its amazing concepts and select your favorite one - from music, news and agency to blog, fashion, and movie. Enhance the way you deliver your content with over 50 unique design elements, 3 sidebar styles, parallax and scrolling effects, several header and footer styles, and a responsive master slider. Take your website to the next level and use Tana. GoodLife is a truly stunning and flexible premium WordPress theme. Packed with 10 unique demos and design elements, you can use GoodLife for various uses from sports, games, and travel to fashion, music, news and general blogging. Showcase your content with GoodLife’s 5 unique article pages suited for all needs. Enhancing your posts with galleries and videos is becoming widely popular, and this theme comes prepared with special layouts for these posts formats. Oh, and I forgot to mention, GoodLife comes bundled with several premium plugins such as: Visual Composer, Essential Grid, Maintenance PRO and Viral Quiz Builder. 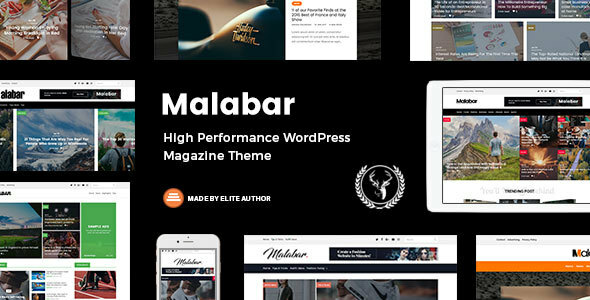 Perfect for magazine, news, and blog websites, as well as with video and gallery post support, Malabar is an awesome WordPress theme. Being built as a high-performance theme, Malabar will not let down during any traffic conditions. It is tested and compatible with most SEO plugins, as well as being SEO optimized. Malabar uses Drag & Drop page builder to easily create and edit page elements. It comes with over 600 font options, an extensive admin panel, several posts templates, and 3 custom widgets. Your website will look just as amazing on mobile devices because the theme is also fully responsive. Check it out! 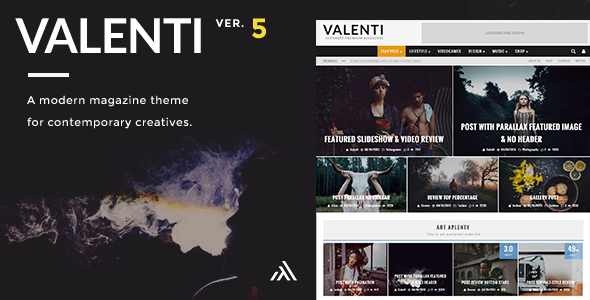 With almost 10,000 sales and a rating of over 4.8, it is safe to say the Valenti is one of the best news premium WordPress themes. Valenti comes with a bunch of amazing features and an exclusive drag & drop page builder, making it easy and fun to build your site. This theme can also be used as a review theme because it comes with an integrated review system. They recently updated and enhanced it with several new features like sticky sidebars, menus, and logos. They also worked on the performance and improved it, as well as added different footer layouts and blog styles. Valenti offers the possibility to choose a different layout for each featured image so you create unique and engaging posts. The theme is also well translated (with 11 translations) and RTL ready, which is always a plus! One of the top selling news and blog themes on ThemeForest, CheerUp is an exceptional, beautiful, bold theme. Packing 8 unique designs and over 300 homepages, it is safe to say that you will find the perfect one for you. Cheer up is optimized to be fast, it has Pinterest and Twitter integration so you can share your images and posts easily. It is also integrated with WooCommerce, a Drag & Drop page builder, and translation ready. CheerUp provides a wide variety of sliders, headers, posts, and footer styles. Give it a shot now! 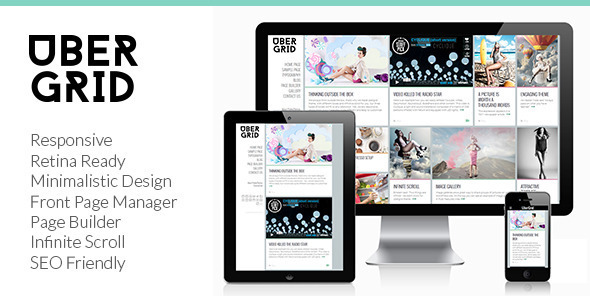 Like the name suggests, Ubergrid is a grid-based, minimalist premium theme suitable for a variety of uses. The theme is fully responsive and it scales beautifully to all devices and sizes. It’s extremely easy to customize it from the Theme Options panel, where you can add your own style to the theme. Importing the demo content is only one click away with Ubergrid and then you can model it however you want using the powerful page builder. 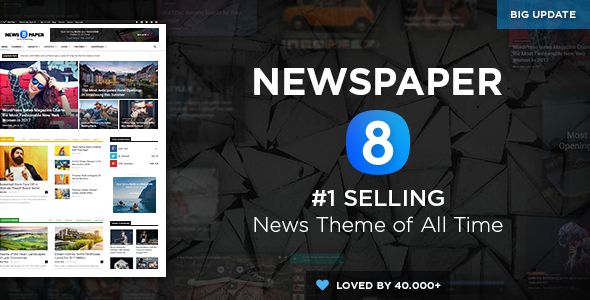 Deliver your news in a creative way with this premium news theme! 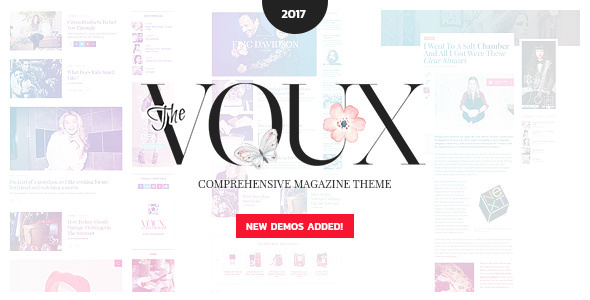 Created by FuelThemes, The Voux is a lightweight, beautiful and stylish theme. Its simplistic, yet striking design makes The Voux the perfect choice for a news magazine. If you are not sold, I recommend checking out the demo and seeing how amazing the effects are. You can create your site in minutes, because The Voux has various pre-made demos and unique headers you can choose from to get started. It fully supports WooCommerce and it is responsive as well. For each type of article, you can choose a different layout to better suit your content. If you are feeling overwhelmed by all the functionality this theme offers, you can use the interactive Sidekick guide and get help. Deliver awesome content in a stylish way. Considered by many in the WordPress Community to be a "hidden gem", The Journal is a Free Magazine WP Template created with great style and taste by Themefuse. The theme is equipped with many customization options such as a visual builder, color settings or typography as well as a number of tools ranging from SEO to automated backups or responsiveness. You'll discover much more marvelous features with The Journal. There is no downside to this free theme as the attention to details in making it is almost no different than that of a paid theme. Powered the by free Unyson framework, its back-end is easy to understand and reprogram as per the developer's needs and with the right coding knowledge, new options can be added to further improve it. With more than 40.000 downloads, it’s safe to say this is one of the best and most popular themes for news, and not just that, you can use it also for publishing and review sites. It has an elegant design, is very flexible, translations are integrated, and is very easy to use and set up. The demo content comes with it - so you don’t start from scratch. It is packed with a page builder, and loads incredibly fast. And trust me, when your website is full of content, this is important. 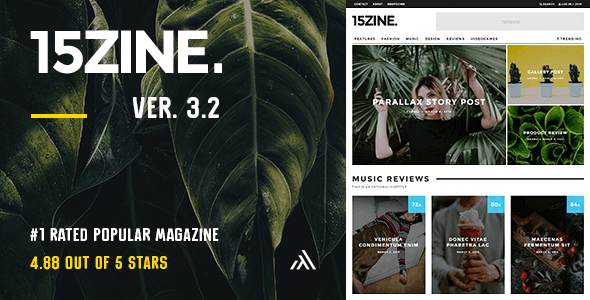 One of the top-rated premium magazine themes on ThemeForest, 15Zine brings everything to the table in a unique and creative way. Just a couple of the features of this amazing theme are: dark and light skins to mix, different styles for pages and posts featured image, infinite scroll and infinite post load, incredible Ajax mega menus, and much more. 15Zine is an intuitive, easy-to-use WordPress news theme and you will hardly need the documentation, but if you do – it’s available, extensive and detailed. It will help recreate the demo with step by step instructions, and if you still need help, the customer support team is ever present for you. Let’s face it, there are many more stunning News/Magazine themes to enhance your content, but I hope you can find the perfect one on this list. And of course, if you have any suggestions or questions, feel free to let me know – I’d love to know your thoughts!